Want to know how you can always borrow money responsibly? It doesn’t matter whether from a bank, a friend, another lender, or even the Albuquerque title loan experts at My Tio Rico. Following these best practices while borrowing money is sure to keep you in good standings and acting responsibly. At My Tio Rico, you can get an Albuquerque title loan up to $100,000. That doesn’t mean you should take the whole thing! With excess cash on hands, it’s easy for us to spend money on things we don’t need or can’t afford, which will only get yourself, your finances, and your credit score sent down the drain! Remember that old saying, “take what you need?” That’s a great saying to live by when borrowing money responsibly. By doing this, you know you’re going to be able to afford to pay it back on time. Loans come with important documents for a reason! Make sure you know all the guidelines you have to follow before signing them! You don’t want to put your signature on anything you don’t understand ever, so make sure you know exactly what you’re getting yourself into by understanding exactly what is expected of you. Be sure to keep all of your Albuquerque title loan documents in a safe spot that is readily accessible. If you ever need to refer to these documents, it’s good to know that they are safe and organized in one place. It’s also a good idea to keep track of what you’ve paid and what you owe. 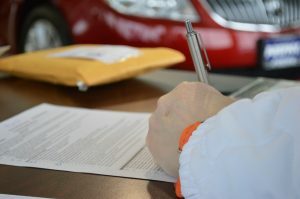 Keep a spreadsheet of your payments safe with any of your signed paperwork. In all cases, your lender is willing to work with you. That’s why you were given the loan in the first place. If you need help with anything or have any questions, don’t hesitate to ask them before it’s too late. Interested in learning more about the Albuquerque title loan or personal loan programs that My Tio Rico has to offer? Contact one of our experts by telling us a little about yourself and submitting the form to your right. We will assign an expert to be in contact with you to address your unique needs as soon as possible.